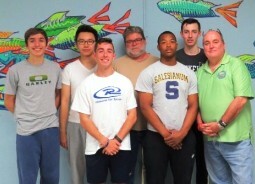 This month, we'd like to thank all of the volunteers who share their time and talents with Joseph's House. Did you know that last year, over 200 volunteers logged 4,655 hours of volunteer service? That's 4,655 hours of meals served, thousands of donated wish list items and casseroles, countless conversations shared, and invaluable support and care given to the 1,926 homeless men and women who came to Joseph's House last year for practical help and hope. Thank you volunteers! Joseph's House wouldn't be the same without you. Sheridan recently stopped by Joseph's House to let us know how he's doing. 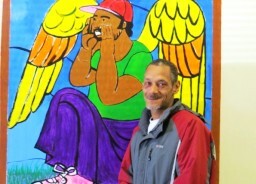 Sheridan came to JH in January after losing his housing, and stayed with us for a month while he connected with partner agencies to access services and find suitable housing. Now living on his own in an apartment, Sheridan tells us that things are falling into place for him and he's looking forward to the future. Welcome to Joseph's House Tricia Bradly! Tricia joined JH in March as our new Program Director, and comes to us with 17 years working with those experiencing homelessness and with partners whose goal it was to end homelessness in Montgomery County, PA. Tricia is excited to join the team to help JH in moving forward with meeting our mission and providing more comprehensive services. April is Fair Housing Month. In her article "What Is Fair Housing If You Have No Housing," Maria Foscarinis of the National Law Center on Homelessness and Poverty writes, "It is a common misconception that people become homeless as a result of personal failures or poor choices. But by far the overwhelming cause of homelessness is the scarcity of affordable housing." Learn more about Fair Housing and homelessness here. Do you have a green thumb? JH needs some volunteers to donate pots and soil, and re-pot about 10 indoor plants for us. If you're able to help, please contact Tricia Bradly at tb@jhoc.org. when the stock market loses two points?